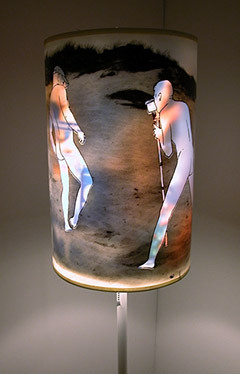 The video projection presents a figure appearing and disappearing as he approaches the blue-void central background. The sound of him walking around and off camera can also be heard. 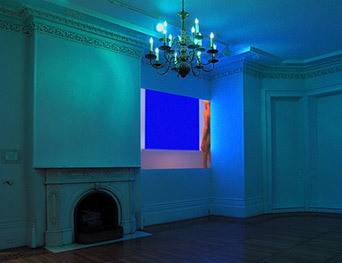 The ornate features of this room were selectively lit to emphasize and contrast with the video that explores the sense of emptiness and the potential of a blue-screen space. 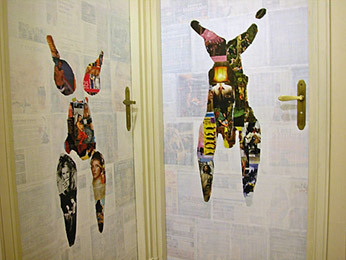 Body Print: Paris 12/02/05 is a live-performance/collage made directly on two of the washrooms doors at the Canadian Cultural Centre in Paris. A video of the Body Print performance was presented on a monitor in the corridor near the washrooms of the Canadian Cultural Centre in Paris. During the video the two subjects painted each other with blue tint glue and pressed their bodies against door. The resulting glue print was cover with material of the subjects choosing. While I removed sections that did not adhere, the subjects washed the glue off themselves. In this beach scene, a collage of advertising rotates through the bodies of people shooting a video. For this work I have digitally collaged over a display that features running shoe with lifestyle and consumer ads. 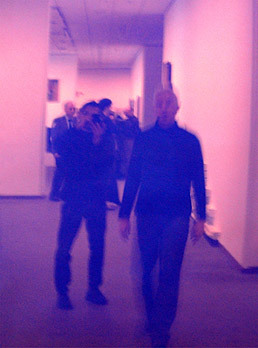 A digital photo-print of my reflection in a monochrome painting by Yves Klein hung in the Neue Nationalgalerie in Berlin.